When you spend your days responding to the needs of toddlers, it’s the little things that can add up to chaos. It’s the toys that are scattered across the floor. Again. It’s the laundry load that still hasn’t made it to the dryer and has to get re-washed. Again. It’s the pile of lists, coupons, notes and unfiled papers that take over the kitchen counter and leave no room for getting dinner on the table. It’s the dishes filling the sink and spilling over its borders. It’s that nagging feeling you’re forgetting something important. It’s worrying that you’re giving the best of your time to keeping up with the to-do’s that never seem to get done, and missing out on moments with those who matter most. It’s the lack of white space in your physical environment that can add up to physical and mental chaos. The chaos begins to wear you down. It can impair your ability to focus, to act, and to respond to the normal sensory inputs of the day without hitting overload by 8:02 am. If can make you feel defeated before the day even starts. If this is where you are right now, dear mama, you are not alone. Clutter chaos also affects the kids. They are just as distracted and overwhelmed as we are (if not even more so) when the house itself is not peaceful and calming. This affects their ability to focus and certainly can affect their behavior and level of activity. It’s a self-perpetuating cycle. So how do we wrangle the clutter and calm the chaos? Where the heck do we start?? The simplest place to start is to give yourself a win. Make the bed! Honestly, if you don’t care about the bed being made, I’m not here to judge. But it is probably the smallest act you can do to clean up about 50% of the square footage in your bedroom and give you a sense of calm. And it’s a little contagious. A made-up bed will point you to the other things that can be done quickly, like corralling the laundry or putting away the stack of clothes on the dresser and maybe whatever’s on the nightstand. We aren’t talking deep-dive organizing, just creating some white space in which to function. Before you know it, one room is under control. Next up is a bigger win: the kitchen sink. Whether it takes several 5-minute sprints throughout the day or whether you can power through it at nap time or after everyone has gone to bed, the goal here is to get every last dish and pan washed and put in its home. Wipe down the sink and faucet. When it’s done, start to tackle the counters on either side of the sink and work your way around the room, creating a beacon of clean that just keeps spreading. It might take a couple of hours or it might take a couple of days. Keep at it until all that remains on the counters are the items that live on there. Then wipe down those beautiful counters and scrub the empty sink so they are shining clean. The power of a clean kitchen counter in a house with young kids can’t be over emphasized. By removing the clutter from the sink and counters, you are creating more white space (and room to function). And once you clear the backlog and get to ground zero, you’ll have motivation to maintain a clean counter — and it won’t require much time or effort. So now we’ve tackled the 2 rooms in the house where you are likely to spend the greatest amount of time. Take a moment to breathe in the calm! Your kids are going to feel the difference too. If at all possible, I’d encourage you to get the kiddos on board with the next step. It’s time to conquer Mount Washmore. Yep… the laundry situation. If the laundry isn’t already sorted, get it all in one place and create one big pile. Check under beds and dressers, in the diaper bag, stroller, car and anywhere else you can think of that might contain a rogue sock or random pair of pants. The sticky fruit snack residue is a bonus! Have the kids help with sorting. Toddlers will think it’s the best game ever, and it builds on skills they already have. If they don’t sort every item correctly, no big deal! They are engaged and you are getting something done, and you can redirect the stray items to the right pile or basket. If your washer and dryer are front-loading, toddlers can also help put the laundry in the washer, switch loads, clean the lint filter, and take clean items out of the dryer. They are learning life skills and gaining confidence and a sense of value knowing they are doing grown up, real world stuff. Team carry the clean laundry basket to the folding spot. As you fold, allow the kiddo(s) to carry folded items to the rooms where they belong. Yes, you may have to re-fold a few pieces, but they just may surprise you. Give them a stack of pajamas and tell them to put them in the pajama drawer. Keep the instructions simple and specific, and keep folding while they are shuttling the folded items to their homes. They are staying active and the laundry is getting done! If the toys are constantly being dumped and not played with, there is a good chance your little one is overwhelmed. The first, obvious step is to get all the toys picked up and organized as well as possible. Group like items in baskets or bins. Cars in one bin, play kitchen items in another, etc. until everything has a home. This is only going to work until the bins get dumped again so the next step is to box up a majority of the toys to put on rotation. A rotation system allows your child to have a great variety of toys, but not all at the same time, and this is the key. There are a number of ways to do it, but my favorite is themed boxes. They can be rotated in and back out one day at a time, or for a week, or whatever works well for you child. There may be some core toys that are always available, particularly if they are current favorites. But creating a pared-down variety will do two things: first, it will reduce th overwhelm the child is experiencing that is taking away their ability to focus on play, and second, it will create scarcity with the toys so they will be played with more and enjoyed when they are available. Process papers. It’s the last of the five steps because it’s the hardest, but you’ve got 4 wins under your belt, and by now you are hopefully beginning to breathe again in your decluttered space. This is not a whole house paper purge, which is its own project for another day. Right now we are dealing with the influx of papers that just seems to have piled up overnight. There’s likely something important in there and more than likely a lot of stuff to throw away. This can be done in sprints while the kids are playing, or in a marathon session while they sleep. Check diaper pages, purse, car, and anywhere else paper is accumulating. The aim here is to make as many quick decisions as possible and act on them right away. Take obvious garbage and toss it in the trash or recycle bin. Shred sensitive items, or toss them in a bag to shred when everyone wakes up. Any other papers remaining are going to be one of two things: reference items or action items. Reference items should be filed in their appropriate homes right away if your filing system is accessible. If your entire filing system is in need of an overhaul and you cannot file the papers, you have my permission to put the “to be filed” papers near your filing system and schedule a time to tackle the filing system on another day. But choose a day in the next 2 weeks and commit to it! Any action items that can be done in less than a minute or so should be done right now (i.e. make a phone call, enter a rewards code, write a donation check or donate online, schedule a bill to be paid, write a thank you card, etc… you get the idea) and then the paper can be tossed or shredded. Any other actionable papers need to get some time in your day. Plan for a nap time, early morning or after bedtime session to take as many actions as possible. If needed, schedule them individually. Example: the preschool brochure sitting on the counter is a reminder to research preschool options, and needs to be given project time for research and appointment times for calls and visits. 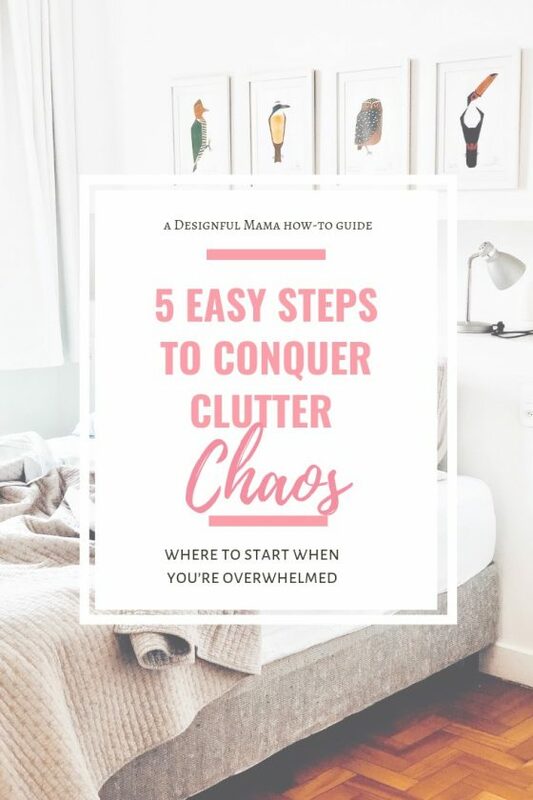 Once you’ve brought some order to the chaos, you can go deeper into purging clutter, mastering mealtimes, creating cleaning routines and setting up systems to keep things running more smoothly. Until then, pour a big cup of coffee, put on some fun music and roll up your sleeves. You’ve got this, mama! « The Mother of all Reading Lists! These are such great steps! I’m a huge fan of using a freshly made bed each morning to slingshot me into productivity mode for the rest of the day. Thank you Liz! It’s definitely nice to start the day with a win, even if it’s a small one!